The Alberta Badlands as seen from a canoe paddling east on the South Saskatchewan towards Estuary Ferry. The Alberta Badlands are being promoted by our provincial and federal governments as the next iconic destination for world travelers to visit. My gallery is in Empress...a village that straddles the Alberta Saskatchewan border. It means that we are the eastern gateway to the Great Canadian Badlands to the west of us and the doorway to the vast desert known as the Great Sandhills to the east. Smack in the middle we are. Promote away. The government's idea is that for tourists leaving the lush forests and fresh air of the famous Rocky Mountain town sites, it's only a hop, skip and a jump down the highway into a semi-arid world of cactus, coyotes and rattlesnakes. Another experience on the grand tour. The road will take the tourists through Drumheller and the famous Tyrell Museum, of course. Not a road less traveled, but after rubbing shoulders with the throngs in Banff, the Dinosaur Trail will present itself as an uncrowded contrast. But those travelers from distant shores are going to miss out on little known routes through the Canadian Badlands that even few locals have experienced...the waterways that allow a novice or experienced canoist to see the Badlands up close and personal in a way unavailable to a tourist on wheels. There are two rivers that flow through the Alberta Badlands...the laconic Red Deer and the faster moving South Saskatchewan. Both were routes used by fur traders making their way to and from Hudson Bay. Both rivers make for fun canoe trips today. 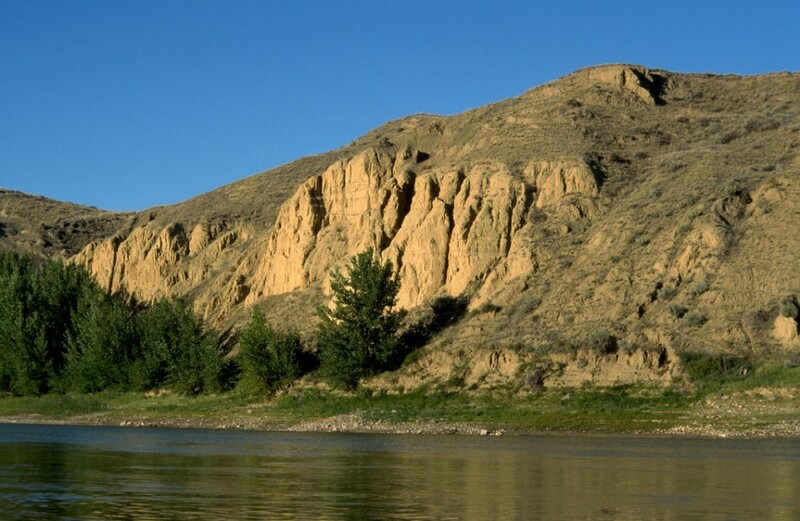 In the Spring the Red Deer River carries the snow melt from the mountains west of Rocky Mountain House through the parklands in the centre of the province into broad valleys sided by the steep barren hills of the Canadian Badlands. In June the river runs fast and carries with it a lot of debris. Wait 'til late in the month of the beginning of July to hit the water. But on the other hand, don't wait until September. It it's a dry year...and this is semi-desert country...you may have to use your paddle like a pole to make it past some sandbars. The South Saskatchewan River is really the eastern end of the same Bow River that passes through Banff, Calgary and the Siksika First Nation. At some point between Gleichen/Siksika and Medicine Hat the river gods decided to give it a new moniker - the South Saskatchewan. Who knew?? The South Saskatchewan is wider, deeper and faster than the Red Deer River. There are no rapids or other fast water, but if you're a novice when it comes to canoeing, start your education on the Red Deer. The rivers meet a couple of miles east of my home town...keep that in mind as you read on. 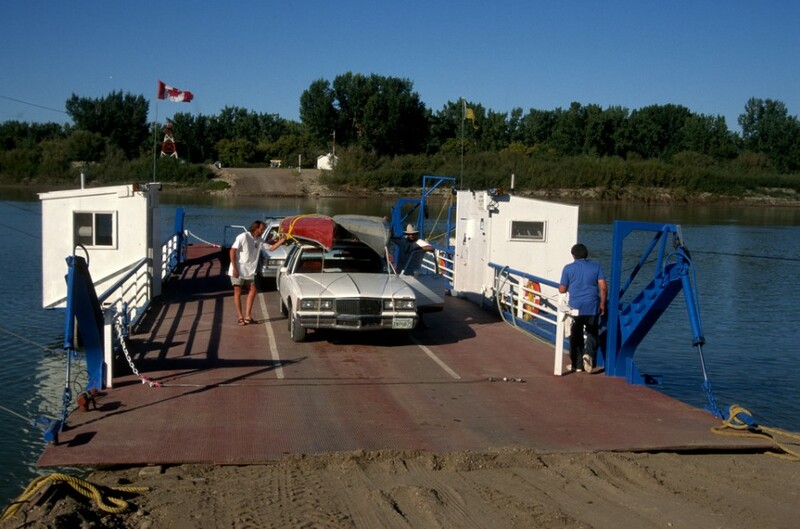 A canoe trip through the Alberta Badlands ends at the Estuary Ferry near Empress. The ferry operates from 7am to midnight seven days a week. The operators take 1 hour lunch/dinner breaks from 12-1pm and 5-6pm. 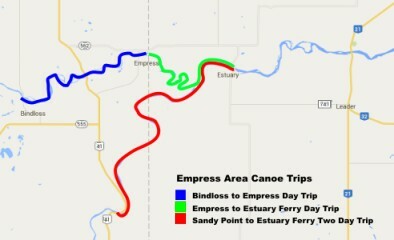 As you can see from the graphic above there are three easy canoe trips that will bring you close to my little village. If you launch your canoe at the Bindloss bridge you can plan on pulling ashore at Peter Fidler Campground in Empress...which just happens to be at the end of my street. Or put your canoe in the water at Peter Fiddler and paddle east to the Estuary Ferry just over the Saskatchewan border. If you want a little more of an adventure begin at Alberta's Sandy Point Campground at the point where Highway 41 crosses the South Saskatchewan and plan on a two day trip to the Estuary Ferry. The ferry was the end of the line for these folks who planned ahead and left a vehicle at the Estuary Ferry crossing. They left another car at the Sandy Point campground. If you come to Empress to experience the Alberta Badlands by canoe, I'll help you find a way to get the canoe back to your car at the end of the day! Just keep me in the loop when you're making your plans. If you're planning a trip, you musn't forget your camera. There's wildlife galore. You'll probably see various shorebirds fishing in the shallows and if you're a knowledgeable birder I bet you'll be able to spot some rather rare species. Keep your eye out for the muskrat and beaver that make the rivers their home. Though deer and elk are nocturnal they'll often head to the river to drink late in the afternoon. If you're lucky you may even see a moose. Other things to do when your in the neighborhood!